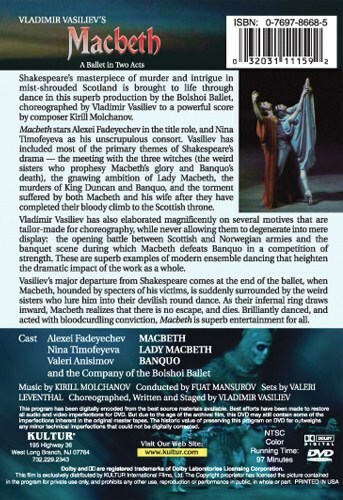 Shakespeare's masterpiece of murder and intrigue in mist-shrouded Scotland is brought to life through dance in this superb production by the Bolshoi Ballet taped live at Moscow's historic Bolshoi Theatre. 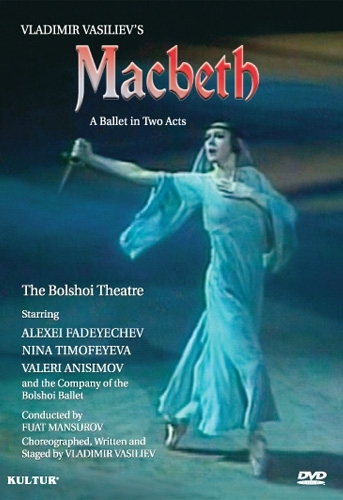 Choreographed by Vladimir Vasiliev in 1980 to powerful music by the celebrated composer, Kirill Molchanov, Macbeth stars Alexei Fadeyechev in the title role and Nina Timofeyeva as his unscrupulous consort. Brilliantly danced, and acted with bloodcurdling conviction, Macbeth is superb drama and stunning entertainment for all.